Underpinning method commonly referred to as push piers, resistance piers, press pile, or hydraulically driven piers, these systems have been used to address building settlement problems for over 100 years.. Push piers have dominated and proven to be the #1 choose for Foundation Settlement Repair by Civil Engineers, Structural Engineers, Geo Engineers and Foundation Repair Contractors across the world. Push Pier Systems main design is high-strength round steel tube sections, these sections are driven through the underlying soils using hydraulic pressure. Most all push pier systems use a steel plate that is mounted to the footing, Foundation Masters, LLC Engineers will not use steel brackets for two reasons. #1. A section of footer is jack hammed off to install the plate as close to the load bearing wall as possible, This will compromise the original footer design, BAD IDEA!! #2. The mounted plate will not allow for a complete vertical lift as the load bearing pier pipe is not directly located under the load bearing wall or off to the side if you will. this will allow deflection in the pipe over time. So our Engineers came up with away to install piers without having this problem. 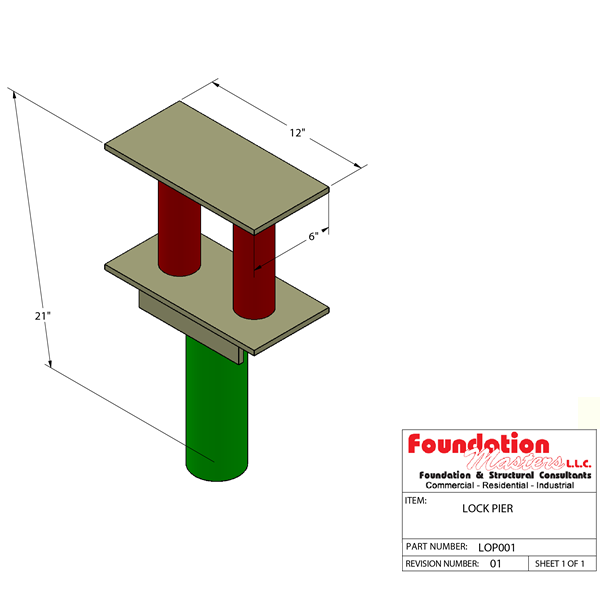 Foundation Masters, LLC designs and builds all pier types, our most used Push Pier System is designed to be installed directly under the load bearing walls. This allows a direct vertical push upwards on the load bearing walls, and provides a much more controlled lift. If you are experiencing some type of Foundation Settlement or already have a bid call our office to set up a FREE inspection by our Civil Engineering Company, all inspections are FREE to homeowner!